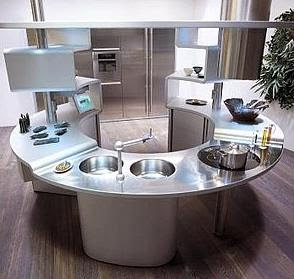 I had a dream last night about working in a unique kitchen that was rather interesting. Let me explain. The scene started with a group of chefs sitting at a picnic table discussing chef things in a very relaxed atmosphere, this same feeling transferred over to a kitchen where I was told, “this is work now, put your game face on.” I was part of a team that was set in a large room standing at a very large circular white table with very bright lights overhead, think hospital setting. I know there were ovens and heat around us, but it was not the center of the kitchen, this white table was. As it turned out everyone around the table had a specialty, something that made them unique in the group. I was paired with a young lady whose specialty was shrimp and couscous. But we also had a box of brightly colored sauces that we applied to plates and food by either paint brush or hypodermic needle. Customers sat in a rather informal setting with only a short wall separating us. There was no menu, customers suggesting things they wanted, or pairing they anticipated and when an order came in, the table of chefs talked quickly about what to make, and just as swiftly went about creating a dish that would circle the table until the chef accepted it. All the time the chef was more a part of the group than a separate figure. Every plate had all 12 chefs hands on it, and communication was very open. Not like reality. So in my dream the perfect order came in for couscous and shrimp so we went to town. I injected the shrimp with basil, and crusted it with pine nuts while my partner made a couscous and shrimp dumpling that was wrapped in plastic wrap and steamed. The plate went around the table everyone adding details with the lightest touches. It was very weird because nobody stressed, and everyone was calm and had their prep ready. Everyone was able to add something to every dish without conflict, in a timely matter. Everyone was happy to be working. Oh, and there was no dishwasher. Nothing got cleaned. Due to sanitation everything went down a trap and was ground up into a powder that used to burn in the stoves so there was no energy cost. A dirty pot, down the trap to be burnt and they bought a new one. I was upset by this and wanted to take a pan home. And then I woke up to feed the cats. As a matter of fact, that's what it's all about. You can't have pudding unless you eat your meat! Top Chef, just as planned.